I love cooking with eggplant because it’s such a meaty vegetable. I have two eggplant recipes for you: “milk” honey eggplant & eggplant parmigiana. You can vegan-ize either recipe. The “Milk” Honey Eggplant is good for a lunch or light dinner. Eggplant parmigiana serves as comfort food for me! Note: I give you my tomato sauce recipe – it is not exact. I don’t really follow a recipe for this, just watching my parents make sauce over the years! I just kinda throw things in the pot, using different vegetables or herbs when I feel like it – maybe that’s why majority of my organic chemistry experiments failed in undergrad. However, I wrote down what I did for this sauce just for you! GOOD VEGAN CHEESE ALERT! Regarding the eggplant parm, I have made a very exciting discovery. My local Trader Joe’s has now started carrying VEGAN CHEESE! For awhile I was buying their soy cheese, without reading the label, and I couldn’t figure out why I wasn’t feeling right. I read the label one day and saw it contains MILK PRODUCTS! What da hell. They advertise soy cheese, but it has milk in it. Makes no sense. So my husband and I returned all the varieties of “soy cheese” we bought and complained. The next week we went in, and they had purely vegan cheese! I was so excited. We bought the mozzarella kind, and it is pretty good. I am not a fan of Daiya cheese. I don’t know why, I just don’t really like it. My friend said it looks/taste like mayonnaise which made me like it even less. But I have found a brand at Whole Foods I like called Galaxy foods in a purple package. 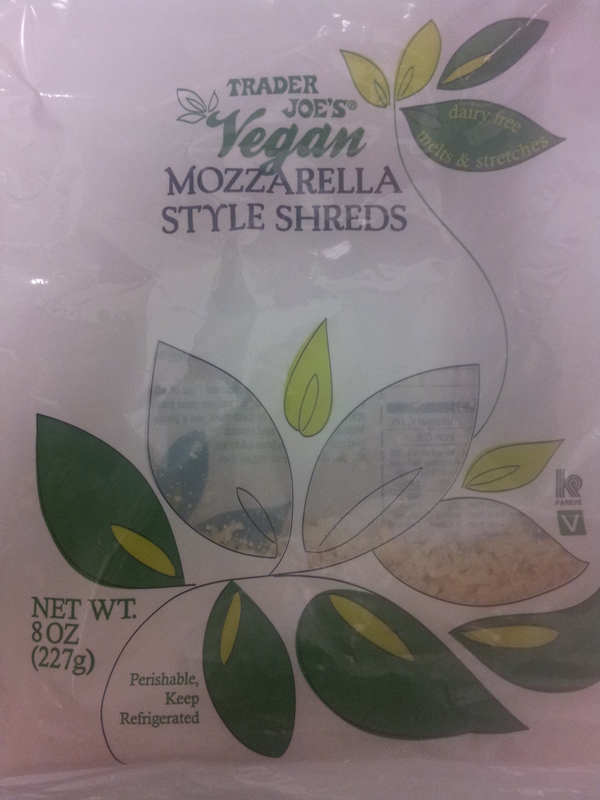 Vegan Mozzarella from Trader Joes! Feels like Christmas to find a good vegan cheese. 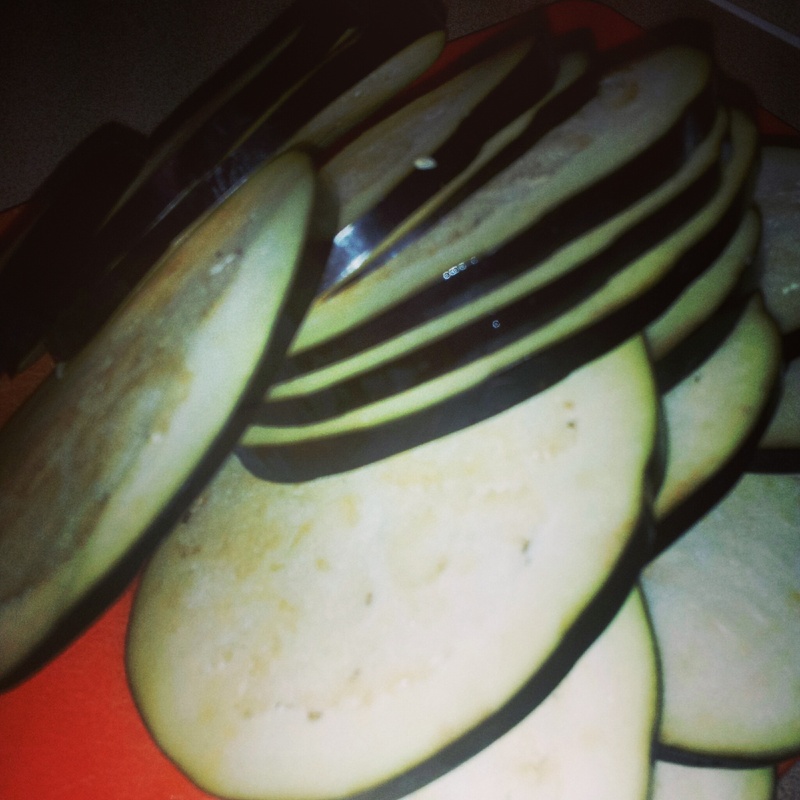 4. fry a couple of slices of eggplant in olive oil until golden brown. flip. “Milk” Honey Eggplant. I found these goat cheese crumbles, and I am kind of obsessed with putting them on everything. 1. Put enough olive oil in the bottom of the pain so you can fry the eggplant. Less is more. Heat to medium, no higher or else you will get hot oil splattering. 2. Dip eggplant in egg yolk, coating evenly. Wipe off any excess egg yolk, then dip in flour, coating evenly. Put slice in oil. Usually, you can put 3 slices at a time. 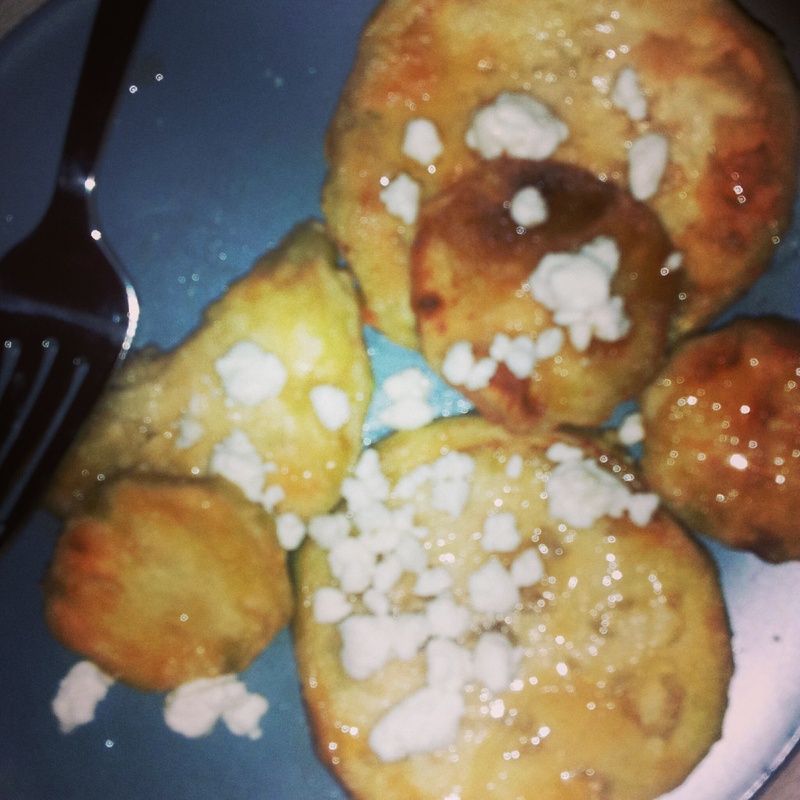 Fry until golden brown and flip, frying each side until perfection. 3. While you are frying slices, make your sauce. Put some olive oil in the bottom of a big pot on medium heat, and saute minced garlic. Don’t burn the garlic! 4. Once the garlic is starting to turn golden, dump the whole can of crushed tomatos. Simmer for 5 minutes. 5. Add mushroom, parsley, oregano/herbs de province, S&P. Lower to low heat, and keep there until ready to use. Taste from time to time to see if you need to add salt. 6. Sauce is done, eggplant is fried, so put another pot on the stove and boil water. Once water is boiling, add half the box of Farfalle. 7. While pasta is cooking, pre-heat oven to 350 degF. 8. Layer fried eggplant in a baking dish, separating layers with tomato sauce. Keep some tomato sauce to put onto of Farfalle. 9. Sprinkle Trader Joes vegan mozzarella on top. Bake at 350 for 10 minutes. 10. Serve eggplant on top of pasta, using remainder sauce to top. eggplant is pretty and pretty delicious. It’s hard to come by knowledgeable people about this subject, but you sound like you know what you’re talking about!